To us, these are for maybe a little fresh eating, but mostly pies and other baked confections. Peaches being self-fruitful, those not needing a very great lot of them can do with a single tree. Peach types further divide in a couple of ways: yellow vs. white, and clingstone vs. freestone. One source says that “Peaches with white flesh typically are very sweet with little acidity, while yellow-fleshed peaches typically have an acidic tang coupled with sweetness, though this [varies greatly]…Europeans and North Americans have historically favoured the acidic, yellow-fleshed kinds.” Take it for what it’s worth. As to the stoning “habit”: in “clingstone” peach types, the flesh literally “clings” to the stone, and has to be cut away with a knife (or one’s teeth); in “freestone” types, the stone easily separates from the flesh. Older peach types are clingstones, but nowadays such types are used almost exclusively for processing rather than dessert use, owing to the annoyance that clinging can be. There seems to be no noticeable difference in flavor or eating quality (other than mechanics) between the types. In the cold-winter/dry-summer climate we have, peach-leaf curl, the commonest major peach-tree disease, is rare, so disease resistance is not, for us, a major consideration in cultivar selection, a pleasant change. Our biggest issue is cold-hardiness. 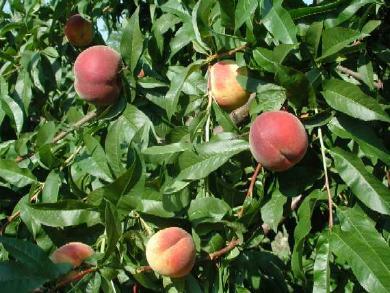 With peaches, as with several sorts of fruit, it is not really the hardiness of the plant or tree that is the crux, but rather the “bud hardiness”. Virtually all peach-tree varieties, regardless of how early or late they actually fruit, set blossoms within at most 2 or 3 days of one another. If it is too cold out, the blossoms will be damaged (“toast” one source put it) and will not fruit. So the desideratum, for us, is bud hardiness. Rather than re-invent the wheel, we here refer you the peach-growing pages of the links list farther below. The peach is a small deciduous tree of the subfamily Prunoideae of the amazingly utile family Rosaceae. It is classified, with the almond, in the subgenus Amygdalus within the genus Prunus, distinguished from the other subgenera by its corrugated seed shell. The leaves are lanceolate. Flowers are produced in early spring, prior to the leaves; they may be solitary or paired, and are pink with five petals. The fruit is a “drupe” (a stone fruit), with a single large seed encased in a reddish oval hardwood stone (“pit”); they have yellow or whitish flesh, a delicate aroma, and a velvety skin that bruises easily. Peaches come to us from China, where they are a classic foodstuff, their cultivation being recorded at least as early as the 10th century B.C. Naturally, the Chinese, devoted to the fruit, developed a veritable myriad of cultivars. Our modern word “peach” harks back to about 300 B.C., when the Greek philosopher Theophrastus—wrongly believing the fruit to have originated in Persia—named it after that region. His confusion likely arose from the common importing of peaches from Persia (also mentioned in Roman records). The peach is believed to have reached continental Europe at around the time of the birth of Christ, though they do not seem to appear in England till about 1650. Curiously, the fuzzless nectarine type does not appear in any peach citations from anywhere in the B.C. eras; they are not mentioned till 1720, in the then-new American colonies, where they are grown along with standard peaches in Virginia. The famed peach researcher A. J. Downing has recorded 19 nectarine races as extant in America in 1857. Never plant a peach or nectarine anywhere near an almond tree. The two—closely related—would likely cross-pollinate, yielding very bitter almonds. It was last modified on Monday, 11 February 2019, at 02:11 EST.